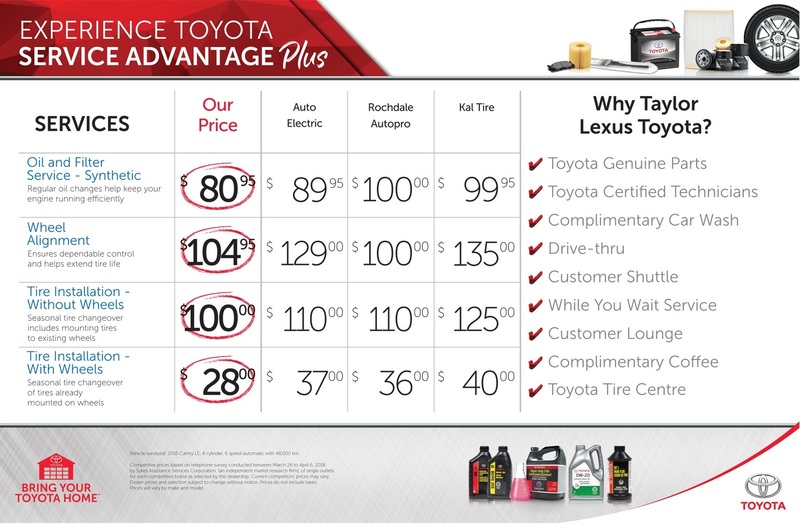 Here's our most recent service price comparison with local merchants here in Regina. Why Pay More Elsewhere? Bring Your Toyota Home! 4&6 Cylinder Engines - $45.95 Synthetic Oil - $80.95 8 Cylinder Engines - $60.95 Synthetic Oil - $116.96 Price includes oil & filter change. No extra charge for fluid levels topped up, and up to 2L of windshield washer fluid. For Your Convenience - We know your time is valuable. Make your appointment for an oil change, and come in to enjoy free WiFi, and coffee while you wait in our comfortable lounge. And don't forget, all oil changes include a FREE car wash! *Please see your Service Advisor for full details.